Mangaluru, Oct 13, 2016 : A goods train derailed at Sirivagilu near Edakumari in Sakleshpur taluk on Wednesday, forcing the South Western Railways to stop Yeshwantpur-Karwar Express (16515) train at Hassan Railway Station. 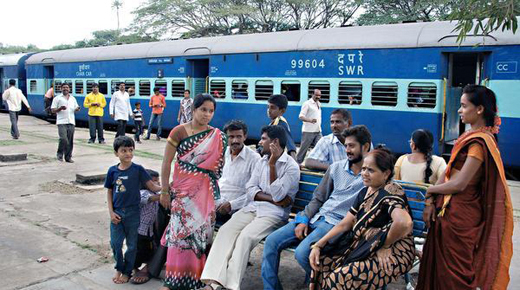 The passengers, who had planned trips from Mangaluru, Karwar and Subramanya, faced a difficult time owing to the incident. The goods train heading to Bengaluru from Mangaluru derailed around 11.15 a.m. According to senior officials of the South Western Railway, one wagon derailed near Sirivagilu, amidst the Western Ghats. There were no reports of casualties. The rescue team rushed to the spot. The Yeshwantpur-Karwar Express was stopped at Hassan station around 11.45 a.m. The passengers were told to either seek a refund of their ticket or wait until the track was restored. While many took the refund and looked for buses to reach their destination, a few stayed back at the railway station. Ravi Kumar, a Tumakuru resident, was accompanying his family to Subramanya. “Fifteen members of our family had planned the trip by train to enjoy the greenery in the Western Ghats. Now, it is difficult to make alternative arrangements to reach our destination,” he said. Ramesh, a resident of Bengaluru, had a similar predicament. He was travelling with his family to attend a wedding in Dharmasthala. He said that the SWR should compensate the loss caused to the passengers. “They return the ticket amount partially, but that will not compensate for the hardship caused to the passengers,” he said.